Tie your own shoes !!! Was googling up for something and this image got me nostalgic. No it’s not Photoshoped. I remember when I was about 9 -10 yrs old, we used to have vendors selling these colored chicks crowded in baskets during summer. If I’m not wrong I remember those costing ten rupees a pair. We never used to be found of the typical pets, cats and dogs (I still am not) but always loved having an aquarium and growing these colored chickens, thou the dye never used to last more than a couple of weeks, if they ever lived that long. But what I used to believe then was they were dyed when they were about to be sold, but actually a non toxic dye is injected into the eggs before they are hatched which causes their downs to be colored. Have to admit, I did a lot of begging to get them then. 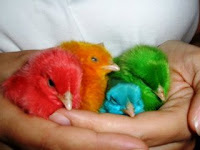 And here, you get colored baby chicks (even colored bunnies) sold during Easter for kids. Would love to have them again, but where do I grow them …my bath tub or oven?? OMGGG! !I used to love them..yeah reminds me of those days too..poor chicks though..they die soon because of that colouring..
oops..sorry that was me..from another blog I was messing around with.But yeah., I remember those chicks..! rakshashi!! talk bout oven!!! human a nee!! huh!!! The scalded dog fears cold water.